I spend a lot of my time writing (loudly) about the problems I see in the world. Particularly, those affecting black mothers and babies. Over the past six years as I've been working as an author and commentator on the African American motherhood experience, I have become deeply frustrated by the lack of credible information or in depth analysis on black women and their breastfeeding experiences. Nor was there one place for us to tell our story. For our voices to be heard on the matter. For every story about the low breastfeeding rates among black women, there is rarely anything on the complexities and nuances of the problem—such as exploring the impact of media stereotypes, the residual effects of our nursing experiences during slavery, the role of infant formula marketing in black communities or the lack of multi-generational support, for example. I recently came under a lot of fire for saying that the media hype over Beyonce’s breastfeeding moment blatantly ignored connecting the dots to black women—and the particular significance of having a black woman of Beyonce’s star power breastfeeding in public. And given that Beyonce was actually feeding an African American child, who is disproportionately less likely to be breastfed, I thought it was a huge failure on the media and the movement’s part not to mention the seemingly obvious connection. But the fact is, the media has a history of failing to accurately include black women in the collective breastfeeding “story.” And we haven’t had a place to tell our story. This week, I launched a new online resource called Black Breastfeeding 360°, to offer a never-seen-before comprehensive view into the black breastfeeding experience, to shed light on the shadings and gradations that frame this critical issue, to offer a forum for developing workable strategies, add the human element to the statistics and to amplify the authentic voices of black mothers and fathers. I’ve spent months interviewing experts, advocates, mothers, fathers, grandmothers and grandfathers on their thoughts and experiences with and about breastfeeding in our community. Mothers, fathers, grandparents, and even my “wasband”, have called in to share their thoughts and challenges. The result is an international collection of articles, interviews and research along with audio and video “diaries” of black mothers and fathers in the U.S. and abroad sharing their breastfeeding perspectives. BB360° will serve as a global resource to the media to help them better understand the black breastfeeding experience as they research and report on this matter. The articles, interviews and commentaries can be downloaded for FREE by any online or offline publication. But most importantly, it is a place for black men and women to get helpful resources and hear the voices and see the faces of other breastfeeding women all over the world. 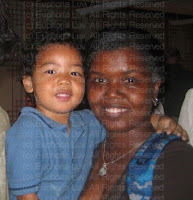 It is a place to show the world who black mothers are, and for the media to take notice. This is our breastfeeding experience. And it is our story to tell. Please join me in welcoming Black Breastfeeding 360°.